Putra Business School, Universiti Putra Malaysia. Faculty of Economics and Management, Universiti Putra Malaysia. Research aims: This study examines perceived self-efficacy and its role in fostering pro-environmental attitude and behaviours. Design/Methodology/Approach: This study employs a quantitative approach to explain the relationship among the variables. The data of 500 individuals are collected and then analysed through the partial least squared (PLS) approach. 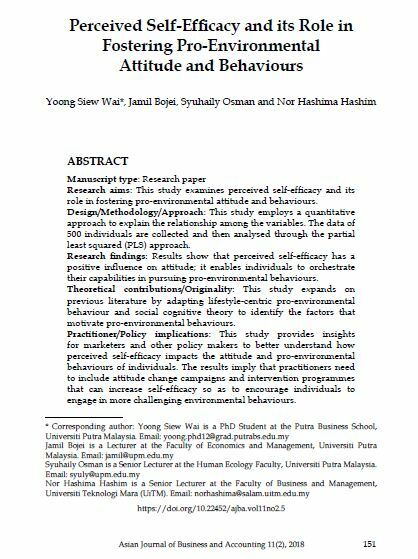 Research findings: Results show that perceived self-efficacy has a positive influence on attitude; it enables individuals to orchestrate their capabilities in pursuing pro-environmental behaviours. Theoretical contributions/Originality: This study expands on previous literature by adapting lifestyle-centric pro-environmental behaviour and social cognitive theory to identify the factors that motivate pro-environmental behaviours. Practitioner/Policy implications: This study provides insights for marketers and other policy makers to better understand how perceived self-efficacy impacts the attitude and pro-environmental behaviours of individuals. The results imply that practitioners need to include attitude change campaigns and intervention programmes that can increase self-efficacy so as to encourage individuals to engage in more challenging environmental behaviours. Research limitation: Since this study focusses on the urban population of Malaysia only, the generalisability of the findings may be restricted. Future studies need to incorporate a larger and more diverse samples.